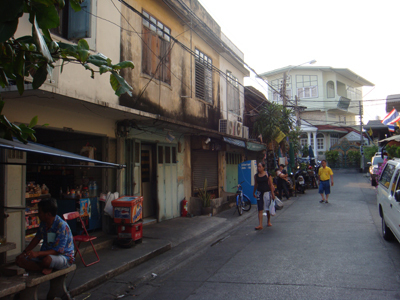 Our guesthouse is tucked away in a quiet corner of a “soi” or alley in an old and charming area. 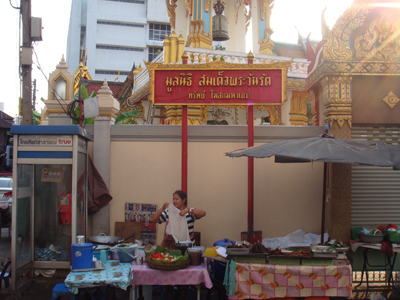 Soi Wat Sangwet is located just off the hip Phra Athit road, only a stone’s throw from seedy Khao San, yet a world away. 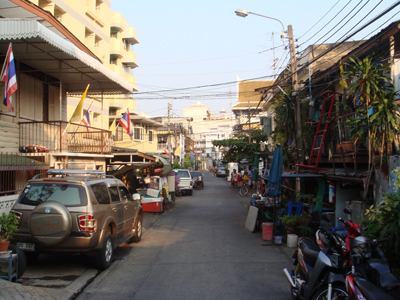 Here, you can experience a truly Thai neighborhood and way of life that you will not in a million years see on Khao San. At the street corner, there is an old Chinese style convenience store where you can find everything from bottles of Singha to toothpaste. It is also here that the local men hang out, drink, discuss politics, and place bets on English football matches. Should an urge for hamburgers or banana pancakes arise, Khao San is only a ten-minute stroll away. After a crazy night out, a short walk back to the guest house and the warm Bangkok breeze will do you good!